At AC Silver we are pleased to be able to offer our customers a range of silver teapots, spanning across recent history and from all across the world. 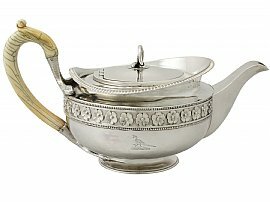 We have all styles and types of silver teapots, including Queen Anne, Bachelor teapots, Louis teapots, and extensive tea services which include teapots, as well as single teapots. Whether you would prefer an antique silver teapot to add a little luxury to your teatime, or you simply wish to have a special piece to display, all of our teapots are in presentation condition and have been fully cleaned, ready for use.